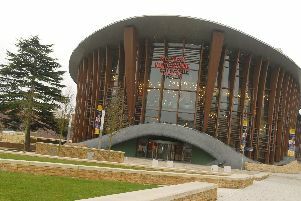 It is time to take a rock and roll trip back to the 1960s with the return of a musical to Aylesbury’s Waterside Theatre. Dreamboats and Petticoats returns with a spectacular stage show, celebrating the 10th anniversary of the multi-million selling CDs featuring some of the greatest songs of the rock ‘n’ roll era. The show is set in 1961, emotions are running high as musicians Norman and Bobby compete to win a national song writing competition - and, more importantly, the attention of the gorgeous Sue. Written by Laurence Marks and Maurice Gran, the writers behind TV classics Goodnight Sweetheart, Birds of a Feather and The New Statesmen, the show features classic tracks from Roy Orbison, The Shadows, Eddie Cochran, Billy Fury and many more. The ultimate rock and roll party comes to the Waterside Theatre in Aylesbury at 7.30pm each night from Monday to Saturday, February 20 to 25. There will also be matinee performances starting at 2.30pm on Thursday and Saturday. To book call the box office on 0844 871 7607 or visit www.atgtickets.co.uk/aylesbury.